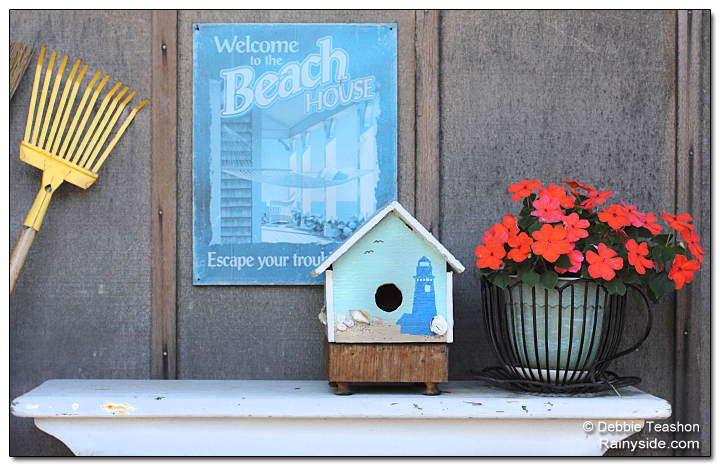 A plain chalet-style birdhouse sits on top of the star of this beach community home's focal point — a post embedded with shells. The end of March is the time when birds hunt for suitable nesting sites to raise their brood. 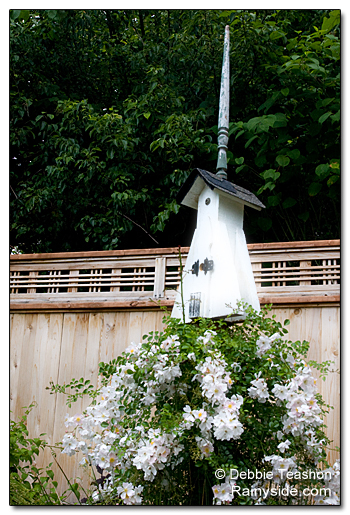 It is the time of year to clean out the birdhouses and make them livable or erect new ones for the next bird couple. Until humans decided to provide homes for fowls, cavity-nesting ones mainly depended on the pileated woodpecker to excavate cavities in snags. Bird watching is a favorite pastime for homeowners. This hobby is helpful for birds who are facing dwindling habitats. 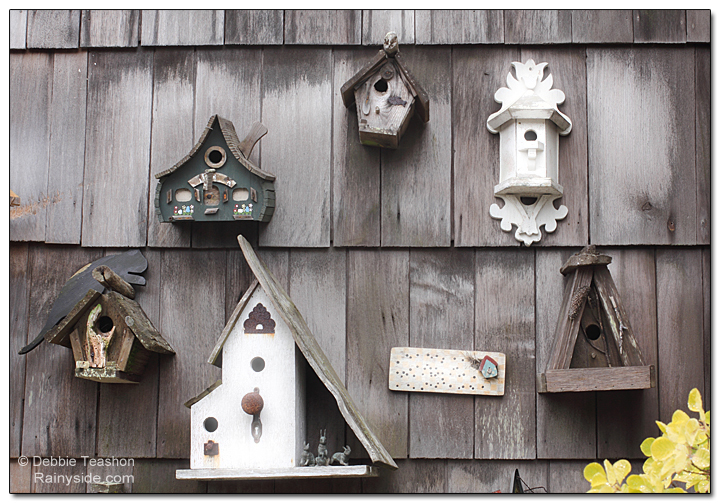 Bird watchers love giving local birds a fantastic place to live that reflects their style. The birds do not care what a birdhouse looks like, as long as their nesting place provides a safe haven to raise a clutch of eggs to fledgling stage. House and entry hole size are more important than looks. 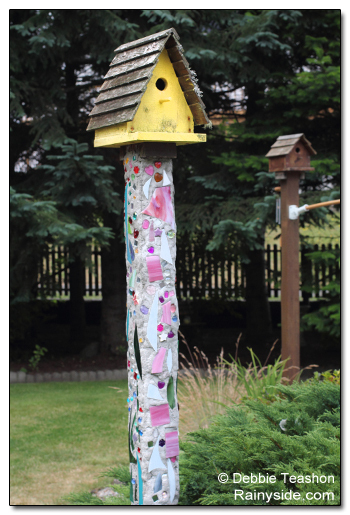 Originally built from lumber, now artisans turn birdhouses into works of art, utilizing recycled and new material in ingenious ways. 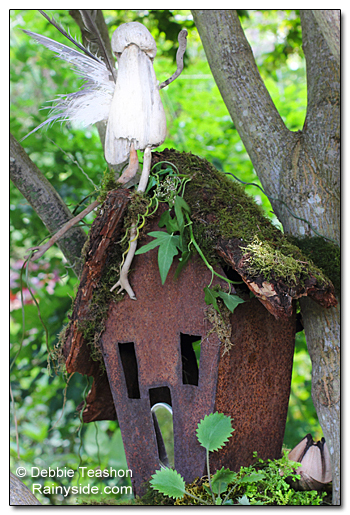 Nest boxes are made of metal, concrete, wood, gourds, and plastic and shaped into all types of whimsical or practical birdhouses. Re-purposed objects are popular adornments. 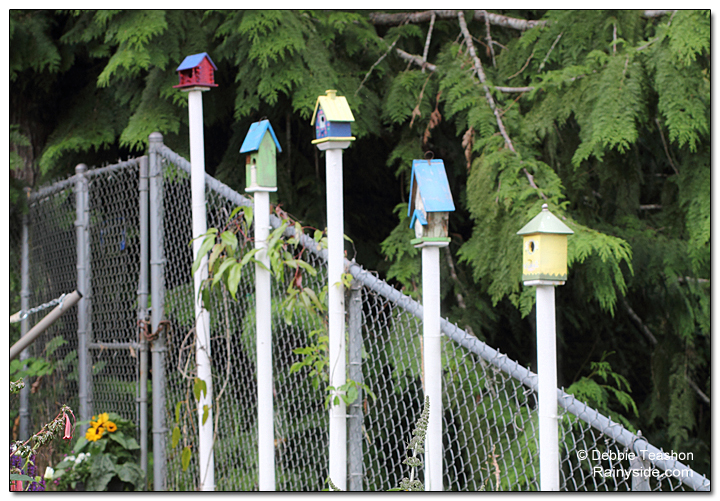 Birdhouses come in all types of shapes and sizes. Castles, log houses, cottages – name a style and chances are someone designed it. 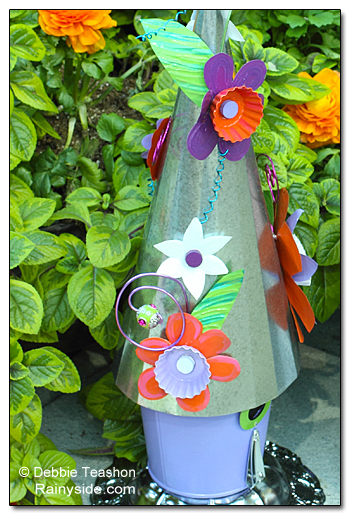 Buy, or build them, there is a birdhouse for any garden theme. 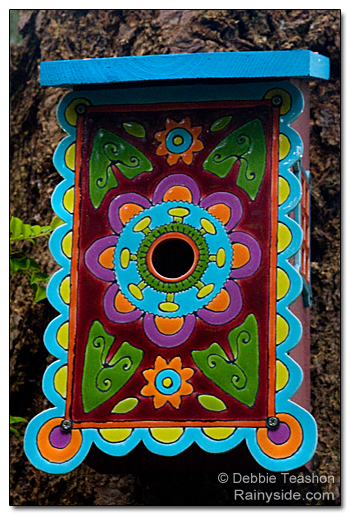 Handcrafted birdhouses usually reflect the artisan. Often a playful sense of humor creeps into the design. Does anyone want an outhouse style? 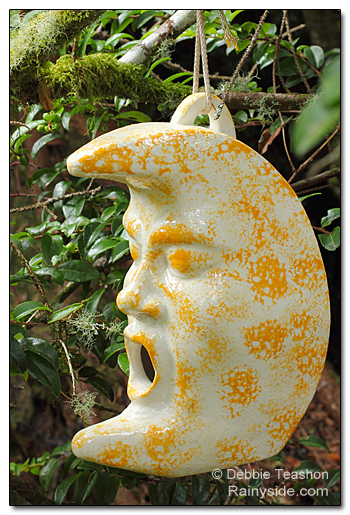 Just paint a quarter moon over the opening of a rustic wood nest box. Anyone who parks their car under a nest knows the birds will quickly embellish that theme. Although comical, a cat-head birdhouse is a bit creepy when the bird is forced to pass through a gaping open mouth to get inside. Some bird enthusiasts mount their nest box on an ornate post. Posts are not solely made from plumbing pipe or plain 4 x 4 lumber anymore. 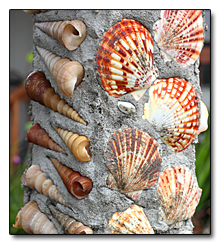 They are tiled, painted, or embed mortar with seashells or rocks. Artificial birdhouses unless built to a bird’s specifications (box dimension and entrance size) will unlikely lure a bird into using it. If you have a particular species you want to attract to your birdhouse, then you want to build to their taste, not yours. The other consideration is the placement of the nest box into the species’ preferred habitat. If the birdhouse is created only for art, ignore all advice. Platforms are great for birds who like to build open nests. Tucked up under the eaves of the house protects the babies from the weather. Rather than create a generic platform out of wood, hang up an ornate outdoor wall sconce or planter filled with soil. The birds will build their nests on almost anything that is protected and sturdy. 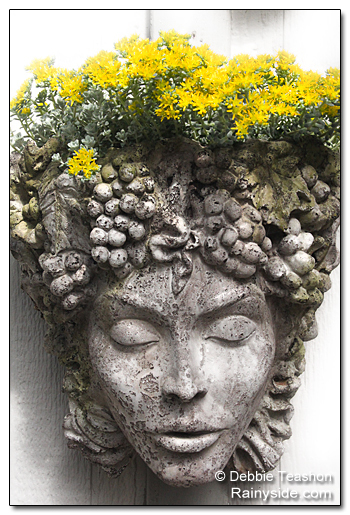 Birds will utilize Aphrodite's head planter as a nesting platform, and why not? Position the platform 6-10 feet high, and the birds will nest on any figure’s head, even a goddess's head. 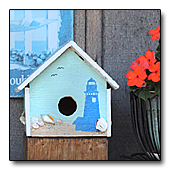 This birdhouse is more for decoration sitting on a beach cottage's porch, yet could also house birds in another position. 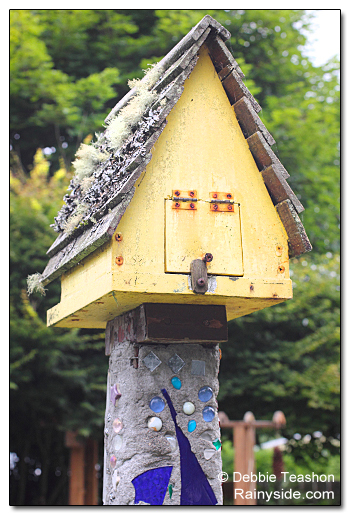 Vashon Island artist Clare Dohna created a mosaic birdhouse. Here is the church, here is the steeple, for the birds. Birds, especially the black cap chickadees, often nest in hanging baskets. If you don't mind, let them stay. After finding the nest, water the planter on the other side until the fledglings have left the nest for good. The birds will return every year to raise their babies. If you don’t want any birds nesting in your flower baskets when the pair is actively building their nest, dismantle it every day. They will soon be discouraged and find another spot to nest. Decide where to place the nest boxes. Site them in an area where bird feces won't cause problems. Any objects under a nest will wind up with a textural patina of the worst kind. Not all birdhouses are suitable for birds. Keep in mind when making your own or buying one to house birds, that you choose the right type for the birds you wish to take up residence. Smaller birds will need smaller openings and smaller nest boxes, whereas the bigger birds such as owls will need larger proportioned houses and openings. Protecting the birdhouse from predators is a necessary precaution. Attached squirrel baffles on the posts prevent predators from climbing up to the house. The construction of the box is key to keeping them out of the birdhouse too. Fortunately, we don’t have to contend with snakes robbing nests; however, keeping feral cats, opossums, and raccoons out is an issue to consider. Keep your cat inside the house. Predator guards (metal or slate rings) attached to the entrance hole prevent squirrels from chewing a larger one. Connecting a block of 3/4 to 1-inch thick wood block with the same size opening over the drilled hole thickens the entry point and prevents a predator from reaching inside. A six-inch roof overhang keeps predators from entering into the nest. Remove the perch. It’s not necessary birds will fly right into the hole. Removing it means a predator doesn't have something to hang on to while reaching inside the nest. Wasps, hornets, and bees will try to take up residence inside a birdhouse. Rub the inside walls and roof with soap every spring to prevent the insects from attaching their nests. Do not use oils or petroleum jelly harmful to birds. Station all bird feeders away from your nest boxes. Birds will pass up a potential nest site where there is too much activity. All that remains to do for a bird habitat is add a clean water source to the garden and plants that feed the birds. You have set up a habitat for the birds and provided housing. Be patient. It may take a few years before the birds will nest in your birdhouse. 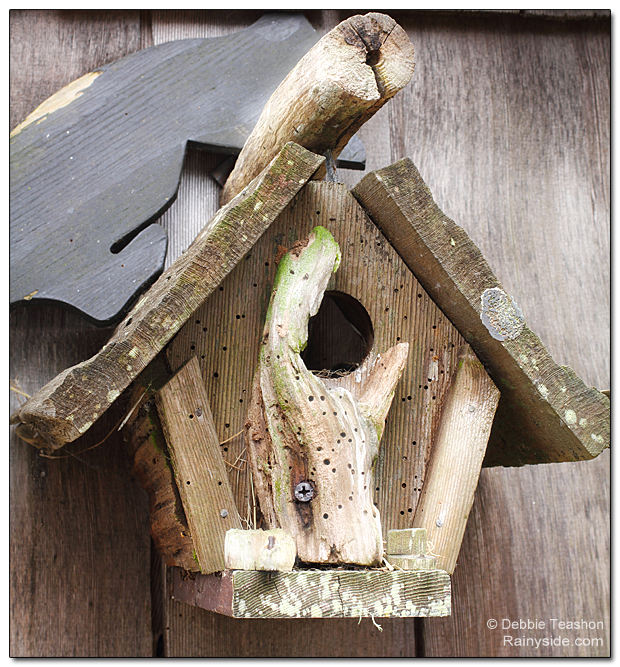 Make the nest box an enjoyable feature in your garden while you wait. Once you attract birds to nesting on your property, they will return every year and provide many seasons of enjoyment. Lining a path up a hill, an assortment of birdhouses stand guard. Another birdhouse on a crafty pole. The backside of the box has a hinged door for clean out after the broods leave the nest. This rusty metal piece found at a vintage market inspires the use of ornate plant hangers or similar objects. Line it with moss to create a cozy space for the birds to find and build their nests. Rust never sleeps even in birdhouses. This charming birdhouse is art and not suitable for aviary housing. 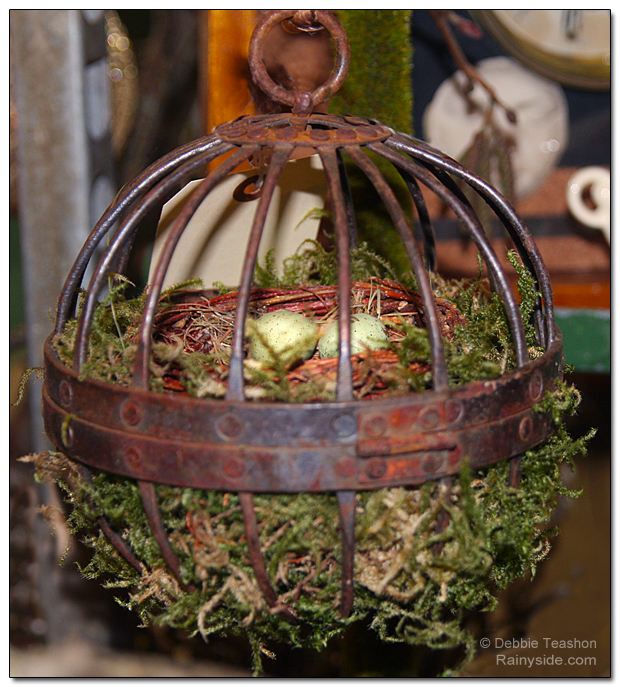 A metal birdhouse found in one of the gardens at the Northwest Flower & Garden Show has surprising elements, such as nail clippers for a perch. 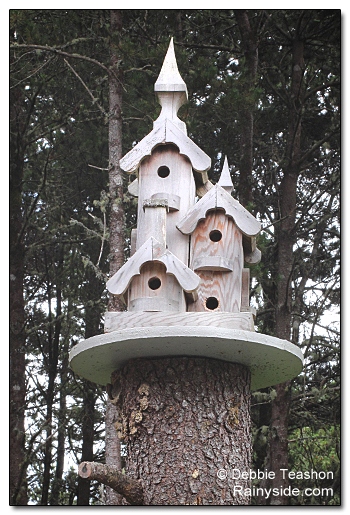 Birds are not the cleanest creatures as you can see from this rustic-style birdhouse that fledged a few. Birds fly to the moon. 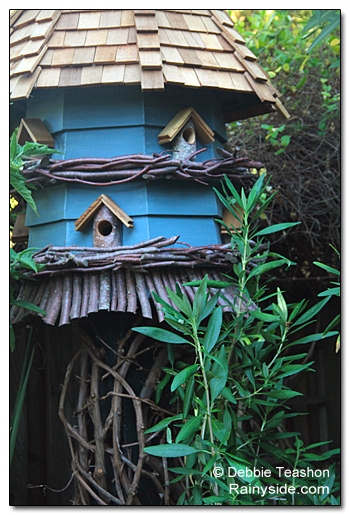 A blue house is both beautiful and functional for birds who like living in condo-like conditions. Birdhouses on top of a stump.